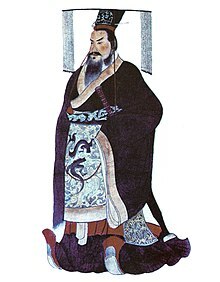 Qin Shi Huang (秦始皇. trans. Qin First Emperor) (259 BC – 210 BC) was the first Emperor of China and the foundation of Qin dynasty. The reason why China suffers bitterly from endless wars is because of the existence of feudal lords and kings. A reliance on ancestral temples initially brought stability, but the revival of states results in the spread of soldiers. Doing so will never bring about stability! Ch'in Shih-huang is going to die! And shoot him at the wall. Then he is going to fall! "Ballad that the oppressed people of China composed" expressing "great delight" at the news of Qin Shi Huang's death, "the builder of the Great Wall and the tyrant, who, while he lived, made 'libellous thoughts in the belly' punishable by death, burned the Confucian books and buried hundreds of Confucian scholars alive", as reported and quoted in Lin Yutang's A History of the Press and Public Opinion in China (1936), p. 23, and in The Importance of Living (1937), pp. 39–40. This page was last edited on 26 February 2019, at 19:06.